My dog Matika was all excited when I pulled out my daypack the other day. She knew what it meant. I’ve been so busy working lately that I haven’t gotten outside much. She has been feeling as cooped up as I have. I drove to Johnson, parked my car along a logging road, and hiked up the frozen mud track until it became a skidder trail. Then patches of ice transformed into a few inches of hard-packed snow. I passed one fellow checking maple sugar lines and another eating lunch in a pickup truck parked next to a skidder. Aside from them, I had the forest all to myself. The rush of open streams and a solitary chickadee were the only sounds that broke the silence. Not until later, on the way out, did I hear a chainsaw in the distance. The running water and thin snowpack gave the surrounding landscape the look of early spring. A bone-chilling wind blowing through the woods told me otherwise. A mild winter this year but, at 1800 feet, winter all the same. When I left the skidder trail, following Long Trail blazes across the crusty snow, mine became the only human tracks. Matika found plenty of animal tracks, though. As empty as the woods seemed, we were not alone. Reaching French Hill Brook, I stopped long enough to feed Matika lunch and scratch a few lines in my field journal. When I started to chill in my own sweat, I turned around and hiked out. No rush. 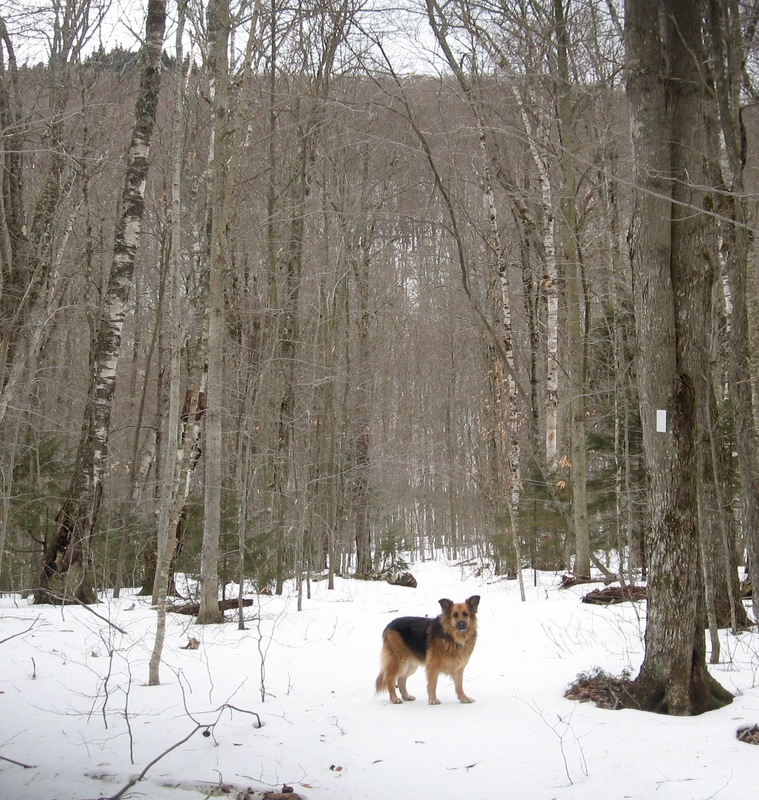 The expression on my dog’s face mirrored my own mood: happy to be tramping through snowy woods and thinking about nothing but the elements and wildness for a while. The beautiful simplicity of these quiet, forested mountains keeps me coming back to them time and time again.